After installing Java Development Kit on Linux/Unix, you may still need to do some configuration to get Java ready for running or compiling Java programs. The following instruction will guide you through the process of setting up JDK for software development. In Linux, ~/.bash_profile is a startup script which generally runs once. This particular file is used for commands which run when the normal user logs in. 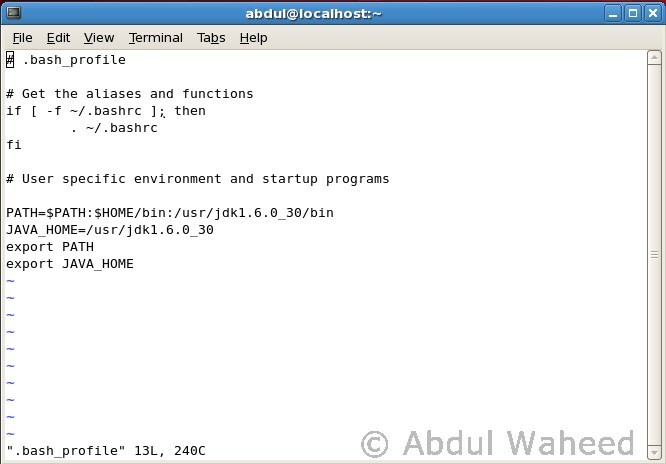 Common uses for .bash_profile are to set environment variables such as PATH, JAVA_HOME, to create aliases for shell commands, and to set the default permissions for newly created files. Note: Don't delete the previous PATH, Just append the jdk path after : like "/usr/jdk1.6.0_30/bin" as above .